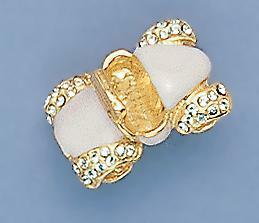 Cute generic convertible Car Pin in pink and gold finish with crystals. Makes a great shoulder pin. Available in other finishes: Silver (PA201), Red and Gold (PA201R). Exotic zebra geometric mother of pearl bangle bracelet. Approximately one inch wide. Lead Free.